Why assign a large budget to protect your data while it's live, then neglect the security of retired data carrying devices? Data security is fast becoming the most protected aspect of any organisation. A data breach can have catastrophic ramifications for both the organisation and individuals. With the ICO (Information Commissioners Office) levying fines of 4% of an organisations turnover for data breaches it's imperative the process for disposal is bulletproof. Oden provides a cast iron solution from establishing a secure chain of custody, tracked transportation, secure off-loading into our secure quarantine cage through to final certified data erasure or on-site/off-site physical data destruction. Our own shredders, punches and data erasure makes sure data is completely eleminated, ensuring our clients are complying with GDPR regulations. IT recycling should be carried out under strict, physical control of all data carrying devices. There are three recognised processes to achieve data security. At Oden, we believe certified data erasure and physical destruction are the only two methods to ensure data is permanently eradicated. Certified data erasure carries out a verification pass after wiping to prove erasure has been successful. Physical destruction tears through the hard drives spindle, platters, casing and logic board rendering all parts of the hard drive completely inoperable. Whilst degaussing destroys magnetic fields the data is not certified as wiped, therefore leaving uncertainty to data security. Oden's solutions for secure data destruction. Don't settle for an unsecured, unreliable method of deleting your data! Do not rely on simple file deletion, quick formatting or re-formatting through operating systems such as Windows. These methods do not delete the file on the drive and can be reversed later with the right tool, therefore, putting your company data at risk. Low-level formatting can securely wipe data however the effectiveness could still depend on the operating system used to carry out the action and so, it is important you do not rely on this. 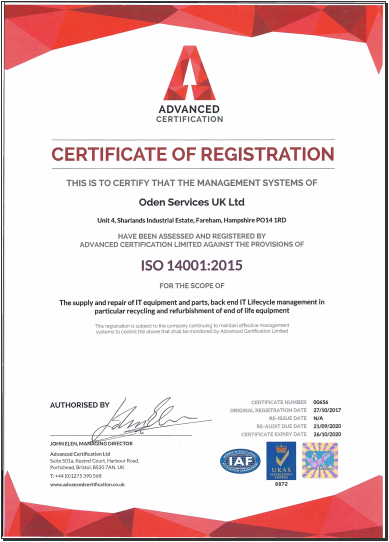 Find out more about Oden's solutions for secure data destruction.